All in-stock orders are shipped within 3 days of receipt of payment. If an item is out of stock we will notify you with an estimated shipping date. Unless otherwise stated, orders are shipped ground/freight depending on weight. An adult signature is required and shipper will drop inside. Please be aware that the Solar Sentinel is shipped in heavy duty, specialized packaging. We highly recommend you keep this packaging. The same is true for our PMP Solar Panel packaging. The Solar Sentinel along with the heavy duty packaging will weight 140lbs. Once the shipper drops inside, you may need to arrange for a friend to help unpacking. You can cut tape and open both ends of the box, removing the foam blocks under the Solar Sentinel. 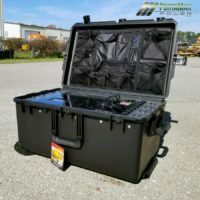 By carefully cutting or tearing the plastic bag surrounding the unit, you will expose handles that will allow you to roll the Solar Sentinel out of the box. Again, it is best to have help unpacking your Solar Sentinel. Once out of the box it is easy to extend the telescopic handle and roll on hard surfaces. Do not lift with the telescopic handle. Use the rubberized carry handles on the case and a helper to lift. At PortaMaxPower, we strive to design and build the finest portable solar products available. We make every effort to inform our potential customers, prior to purchase, what our products will and won’t do. Our goal is 100% customer satisfaction. If you have questions about our products, please ask them prior to purchase, by emailing [email protected].